What Are the Best Plants for Your Midwestern Garden? I put together my top five picks for all-around Best Midwest plants after being contacted by editors at Midwest Living magazine. Here’s my shortlist—including one with crazy beautiful flowers and one that’s so easy to grow that you basically just plant it in the right spot and water it. See the plants that made it on to the Midwest Living list. ‘Joanna Reed’ catmint (Nepeta ‘Joanna Reed’) is one of the tidiest catmints I’ve ever grown, an attribute that cinched a top rating in our trial. The strong stems never flopped and new shoots grow quickly to conceal the declining flowers stems, thus eliminating the need for deadheading. Compact, wide spreading plants (24 inches tall and 48 inches wide) are covered with a continuous display of violet-blue flowers from spring into fall; if you’re thinking that means loads of pollinators, you’d be right! The aromatic, dusty green leaves are not only attractive but also unpalatable to deer—a bragging point shared by many catmints. 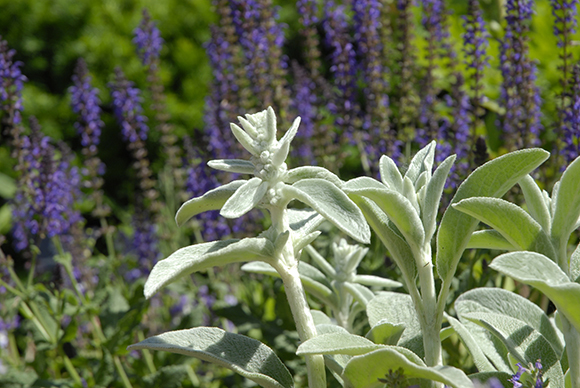 Fuzzy lamb’s ears (Stachys byzantina) pair well with catmint (Nepeta—in the background). To me, lamb’s ears (Stachys byzantina) is an essential perennial for sunny gardens and ‘Big Ears’ is my favorite. Its large, pale silvery-green leaves are velvety soft and the perfect color and textural foil for other perennials—it looks good with both hot- and cool-colored flowers. ‘Big Ears’ is a shy flowerer; in fact, it is touted as non-flowering. Occasionally, a fuzzy flower stem or two pops up with tiny purple flowers hidden in woolly clusters. Low growing and spreading (14 inches tall and 30 inches wide), ‘Big Ears’ is a great groundcover or massing plant. Both of these sun-loving perennials like well-drained soils and are tolerant of hot, dry conditions. Butterfly weed (Asclepias tuberosa) makes my list of best native plants because its flowers are crazy beautiful, and it might just be one of the most important plants of the day. Honestly, the eye-catching bright orange flowers are reason enough to love this plant, but the fact that they attract a myriad of butterflies, including the beloved monarch, makes them invaluable. The survival and success of the monarch butterfly is tied directly to butterfly weed—the caterpillar feeds on the leaves and the adult butterfly on the nectar. 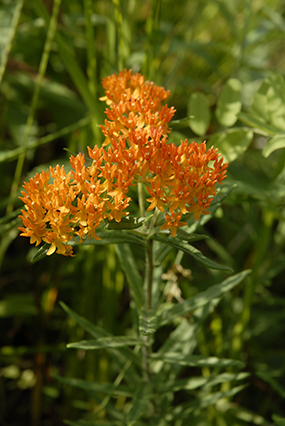 Butterfly weed is a great garden perennial in formal and naturalistic plantings, and because it is commonly seed-grown, flower color varies from orange to yellow to nearly red. The Perennial Plant Association named Asclepias tuberosa the 2017 Perennial Plant of the Year. I haven’t evaluated annuals in more than 20 years, and I don’t personally grow many annuals. However, I’m a huge fan of tender sages—so much so that we started a trial of 105 different nonhardy sages last year. 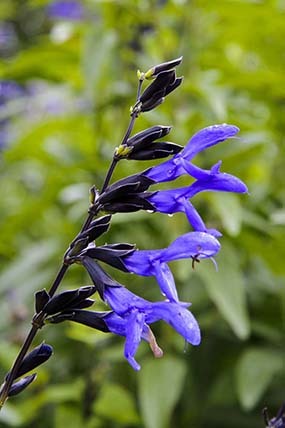 Salvia ‘Black and Blue’ has been around for a while and has proven to be a phenomenal plant for seasonal displays in containers and garden borders. The combination of cobalt blue flowers and near-black calyces and stems is stunning. It blooms from midsummer to frost and attracts hummingbirds, butterflies, and bees aplenty. ‘Black and Blue’ is a rapid grower, reaching 2 to 4 feet tall and 1 to 3 feet wide in a summer, and is best suited to sunny locations. Hostas are quintessential plant-it-and-forget-it perennials. Long-lived and easy-care, hostas come in a wide variety of colors, forms, and sizes. Success is as simple as providing them with adequate water and planting them in partial to dappled shade. Hosta sieboldiana ‘Elegans’ features thick, corrugated blue-green leaves and near-white funnel-shaped flowers in early summer. ‘Elegans’ is robust at 30 inches tall and 48 inches wide, with heart-shaped leaves more than a foot long. Hostas rarely, if ever, need division—I have a big planting of ‘Elegans’ in my home garden that has been in place for more than 20 years with no care beyond removing the old leaves in the spring. Posted on April 21, 2017 April 12, 2017 Author Richard HawkeCategories Horticulture & Display GardensTags best annuals, best native plants, best plants for the midwest, butterfly weed, catmint, garden sage, lamb's ears17 Comments on What Are the Best Plants for Your Midwestern Garden?